Our cities need more green spaces. It helps keep our waters clean, the air we breathe clean, reduces heat island index, provides a habitat for animals and insects, and the list goes on. Urban farming has been gainig popularity and it couldn’t be at a better time. Food is a great way to reconnect people with the land and environment. These two film makers , Ian Cheney and Curt Ellis, have begun a new journey since their last doumentary “King Corn“. This one, involves starting an urban farm in the back of an old truck! Their story is a great one. Virginia Sole Smith gets a great interview (below) at Planet Green. Please see the link for the original posting. PG: Hi Ian. What on earth inspired you to put a farm in the back of a pickup truck? IC: After finishing KING CORN, a film about the roots of America’s burgeoning obesity epidemic, I had a real desire to grow something other than commodity corn. A garden, to be specific: vegetables! But when I moved to New York City two years ago, it didn’t take long to realize I didn’t have any place to grow food. Setting my sights on the 5′ x 8′ bed of my Granddad’s old pickup, Truck Farm was born. I borrowed green roof technology to facilitate good drainage and hold the soil in place, planted a few rows of heirloom seeds and watched the garden grow! PG: What’s the most challenging thing about truck farming? What’s the most fun? PG: Nice trade. So you’ve got basil going. What else grows well for you? PG: And since you’re harvesting so much, you’ve started a Community Supported Agriculture (CSA) program. How does that work? IC: In principle, the CSA works like this: members give twenty bucks at the beginning of the spring, and then every month they get a little bag of greens, herbs, and vegetables delivered to their doorstep. In reality, most of the subscribers live in my neighborhood so I encourage them to just clip a few greens or pluck a few tomatoes on their way home from work. Saves gas! The range of produce this year is pretty big; we’ve got sugar snap peas, tomatoes, arugula, salad greens, chives, summer squash, parsley, basil, oregano, sage, broccoli, okra, hot peppers, and one rangy sunflower. PG: So can I plant a farm in my Subaru Outback? Or in an old bathtub? What other things make good farm/garden vehicles (pun intended)? IC: You bet! Plants like sun, water, and soil — but you can even get away without soil if you find a way to get the plants the nutrients they need. An old bathtub filled with compost and dirt makes a lovely place for a Tub Farm, although admittedly I’d be more excited to see one in the Subaru. In fact, wouldn’t it be nice if car companies started selling cars and trucks with built-in gardens? 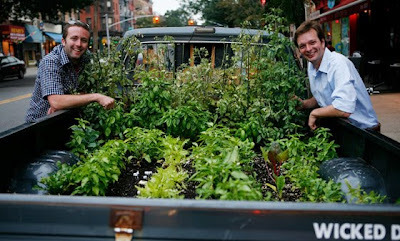 Picture the 2011 Dodge Truck Farm…an edible car! IC: It’s been amazing to see the places where it’s possible to grow food. We’ve seen rooftop farms, barge farms, window farms, backyard Brooklyn chicken farms, and heard folks talk about growing food and raising animals in enormous sky scrapers. Recently we launched the Wicked Delicate Garden Contest, encouraging young people to think about the funniest place they could think of to grow food. Sure, crops planted in toilets or Dad’s sneaker won’t solve our biggest food problems, but it was exciting to see young people equate farming with fun. PG. Plus, how practical for people who want to garden but don’t have any outdoor space! So how could this idea be adapted for different kinds of communities (schools, retirement centers, offices, etc)? IC: Fresh, healthful food shouldn’t be a luxury — it should be everywhere. Fortunately, with a little imagination, a bit of good soil and a handful of seeds, you can grow food in the unlikeliest of places. Rooftops, vacant lots and front lawns are especially promising places for little raised-bed plots of greens and herbs. By actively re-engaging with the land, we not only get a bit more good food, we get a good dose of fun and satisfaction while growing it. I’ve watched enough people – young and old – lean on the old Dodge and smile to know that everybody loves a garden. PG: We want more! What’s next for Truck Farm? IC: We’re currently hard at work finishing Truck Farm the Film, a whimsical hour-long introduction to urban agriculture with the old Dodge as a guide. Also, this fall I’m going to experiment with growing saffron, but when that doesn’t work…maybe rabbits? Visit truck-farm.com to stay tuned! I can't wait for the movie. Have you seen the truck bed liners for truck farms? I could have sworn someone posted about them somewhere, either here or on FB, but I can't find it. I am not sure about liners made especially for trucks. In the movie they talk to a green roof professional (Alive…I think the name was) and actually use the technology for green roofs in the truck bed. Looked pretty simple. I love it! Fitting a farm in an unlikely space, so cool! Great post!Lots of stuff to read and watch now. I really need to start with King Corn. I haven't seen it yet and have it on Netflix.